Coming Up in this Classic Episode: Jon Paul’s vow of honesty lands him his biggest client. Guest stars: Tyra Banks, Cameron Diaz, Liza Minnelli. Ignoring the stares of her fellow diners, a strikingly tall and playful African-American woman in a form-fitting wrap around dress piled her plate high with delicacies from the breakfast buffet at the Rhiga Royal Hotel in Midtown. She grabbed muffins, waffles, biscuits—trigger foods that would send most mortals to a Carbohydrates Anonymous meeting. I stood next to her scooping up some fruit and a little granola trying to stay committed to losing the Freshman 40 I had gained about 10 years ago in college. She reached across me for some bacon and smiled. Having all my life struggled with weight issues, I wanted to hit her. But I restrained myself because this supposed supermodel could be my new client—if I passed this interview. She had final approval over who from my new firm would work with her. Some would have been nervous, but not me. It was 1997, well before any of us knew she would be America’s Next Top Media Mogul. So I knew absolutely nothing about Tyra Banks. For a few months now, I had been struggling to master the duties required to be a junior celebrity publicist. Other than a brief and almost disastrous encounter with Whoopi, so far my primary job had been escorting the firms C-list clients to be the third guest on NY-filmed TV talk shows like Rosie. These clients usually played the sitcom’s whacky next-door neighbor but had a dramatic movie-of-the-week to promote. As a favor to the firm’s heavy-hitter publicists who promised to deliver their headliners, talent bookers slotted in our low-wattage names in the last few minutes of a show. First, I mastered the art of spin. A few days after my job interview-date with Greasy, BusyB called with my first assignment—a very important daily mission involving Liza Minnelli. By 7am, I was to read all the daily gossip columns, cut out and paste up any that mention Liza, and fax them to her manager, assistant and head publicist by 7:30am. No earlier or later. Liza’s entourage seemed awfully high maintenance, but that was fine by me. As cliché as it is for a gay boy, I have been completely devoted to Liza ever since I was six years old and my father took the family to The Venetian Room at Dallas’ fading Fairmont Hotel for a live performance by the diva. It was the waning days of 70’s hotel cabaret but I dressed as if it were the second coming. For weeks I had been prancing around the living room with a top hat and cane found in my stash of dress up clothes singing along to the cassette recording of Cabaret. I was perfecting a heart-wrenching rendition of “Maybe This Time.” At Liza’s performance, I quietly mouthed the words as I sat enraptured by her every word, note, gesture and sequin. Twenty years later, and I couldn’t believe my good fortune to be traveling in her orbit. Which is why I was so unnerved when after a few weeks of successful gossip column faxing, BusyB assigned me a more critical Liza task. “I need you to call Richard Johnson at PageSix and deny that Liza is back in rehab,” he said. Spin sounded an awful like lying to me. Didn’t Greasy say something about my integrity landing me the job? But with no other options, I called Richard. Not surprisingly, he wasn’t buying what I was selling. I paused, and then just tried to be as honest as I could despite the situation. I could hear Richard typing away on his keyboard. “That’s the most honest thing I’ve heard all week,” he said. Next day, PageSix ran with the Liza-back-in-rehab story. But Richard had included at the end of the piece an obscure line about Liza’s reps claiming she was having a medical procedure. Greasy had told me the key to this business was keeping my integrity in tact, and surprisingly that is what charmed the most important gossip columnist. Once I had spin down, BusyB introduced me to the next part of the celebrity publicist dance step. “I need you to cover a shoot with Cameron this morning. Just show up and make sure they don’t ask her to do anything she doesn’t want to do,” he announced. When I arrived at the stark white loft space in the still seedy Meatpacking District, a woman was waving around clothes on a hanger and shouted at me. ““Thank god you’re here! Did you want to look at the selections? I’ve thrown out so many,” the woman said. Her crisp and clean starched white dress shirt indicated she actually hadn’t been working too hard at throwing out anything. There looked to be close to 200 items still hanging on the multiple racks. Cameron Diaz’s photo shoot was my introduction to being part of an entourage. Populating the loft were a collection of stylist characters—clothes stylists, hair stylists, make-up stylists, set stylists, food stylists, stylist stylists and more. Many of the stylists told me later they were Cameron’s “go-to” people, which meant they had worked with the star before and were handpicked for this shoot. Given their closeness with Cameron, it seemed unlikely to me that anyone on the set would ask her to do anything uncomfortable. Covering a photo shoot turned out to be was the most boring thing I’ve suffered through in my life. Close to thirty people hanging out on couches, drinking coffee listening to some unknown alternative rock bands. The only person missing was her boyfriend Matt, whom I had an enormous crush on, and I spent most of my time nervously wondering if he might show up. All that for a second rate teen mag. Weeks later, after I had perfected the two-step foundation of the celebrity flack tap routine with Liza and Cameron, BusyB was ready to trust me with a much more important assignment. This could be my shot at moving up the rungs of entertainment publicity. “One of my girl’s needs someone a little more sophisticated to work with her. Last night, my other kid assigned to her got drunk at an awards show and rode around in her limo with the sunroof open, screaming,” BusyB said. In the taxi on the way to the hotel, I gave myself a pep talk. I might not know anything about this Tyra, or what it meant to “go on book tour,” but I needed to make this work. This was my chance at the big time. After Tyra grazed the breakfast buffet, she got right down to business. I spit out the hotel’s rich coffee and knocked over the dainty china cup. Now, I’ve never really hidden my sexuality, since I came out to my father and stepmother when I was 15 while eating Domino’s pizza around the coffee table watching Cheers. But I was not accustomed to questions about my sexuality being the opening line of a job interview. She had a lot of nerve. But I couldn’t imagine a supermodel surrounded by fag hair stylists and make-up artists could take issue with a gay publicist. The waiter rushed to mop up the mess, and I looked at Tyra confidently. Tyra touched my hand and smiled. She motioned down towards her voluptuous bosom and nodded at me knowingly. I stared at her blankly, not at all sure what she was getting at. “Do you even know who I am?” she asked. I took a sip of newly poured coffee and leaned in, knowing that this was a make it or break it moment. Tyra knitted her brow, opened her mouth, but I continued. Tyra tilted her head, began to nod, and then smiled. She took a big bite of a bagel smothered in cream cheese, and I ate the last crumbs of granola, still jealous of her metabolism. She was a big presence all right—one that might just give a much-needed ratings boost to Alphabet City. A few days after I passed my audition with Tyra, rolls of paper spewed forth from the fax machine recently installed in the firm’s New York office, also known as the basement of my apartment. Winnie barked at the whirring sound and began biting and tearing at the pages coming through. I chased her around the living room as she hopped from futon to futon, pleased that she had invented a new game. Angela arrived to offer assistance. Winnie took one look at Angela and laid down, letting go of the fax. She knew who was in charge. We began piecing together the torn itinerary. She was right, even as a gay guy who idolized the male form, I had a healthy appreciation of the female bounty. Maybe it was envy. From the file I had been reading in preparation for the book tour, there had been quite a bit of controversy over whether Tyra had been surgically enhanced. Angela smiled and rubbed Winnie’s tummy, taking a small bit of paper out of the dog’s mouth and handing it to me. 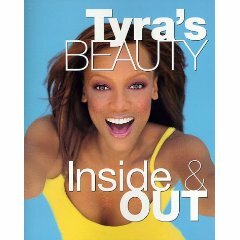 From what I could surmise from the itinerary, we were traveling the country mostly to promote Tyra’s book Inside Out on TV and in bookstores. In addition, we were also squeezing in appearances at Targets and Wal-Marts as part of her contract with CoverGirl. In each city, we would be busy from before dawn to well after midnight, then fly to the next city and start all over again. The night before the tour began, my boss offered more advice on the phone. “Um, right. Call me if you need anything,” he said worriedly. The one thing I needed was a copy of Tyra’s book. Always the overly prepared student, I thought it important to have a thorough knowledge of the material before the teacher gave me a pop quiz. But no one was able to get me a copy—not our office in LA, not even the book publisher. And now it was too late because my flight with Tyra left the next day. I’d just have to come up with an excuse and tell Tyra my dog ate my homework—it was partly true. But I had a nagging feeling Tyra would know I was faking. And I couldn’t afford to screw this up. This entry was posted in Service Entrance. Bookmark the permalink.